My trip to the Alcázar was a pretty spur of the moment thing. Having planned a lazy Sunday in the face of a week of bad weather, I was pleasantly surprised to wake up to sunshine and blue skys. As my previous trip to the Alcázar had been rained off the week before, I took it as a sign and down I went in to Seville on the midday bus. A UNESCO World Heritage Site, a second home to the Spanish Royal Family and a Seville must-see, I had pretty high expectations. The beauty of the building itself can't be denied and, built in the fourteenth century, it is considered to be one of the best examples surviving of Mudéjar architecture in the world. 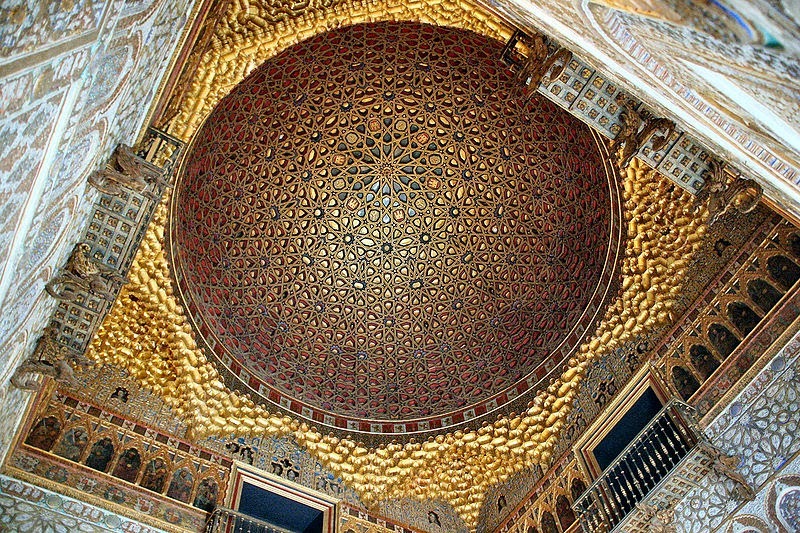 Mudéjar is a style which has strong Moorish influences. The moors where medieval Muslim conquerors from countries like Morocco and Algeria who were in power here in the South of Spain (and much of the Iberian peninsular) from 719 to 1482. With over 700 years to lay roots, you can see how this Arabic style has permeated so many areas of Spain. Arches, natural light, intricate carvings - I just can't get enough of it! I would die to live in a place like this, perhaps a tad unrealistic though, wherever would you buy furniture that could live up to rooms as grand as these. Besides, as the world's oldest royal palace still in use today, I'd have to share it. The palace facade from the courtyard. Welcome to the Salón de Embajadores. The ceremonial centre of the palace, clearly built to astound visiting officials. In my opinion its the Alcázar's crowning glory. Patio de las Doncellas, named after the ladies of the palace who spent much of their time there. Could you imagine a glass of Pinot Grigio with that as a backdrop? Yes please! Under the main bulk of the palace lies this little sanctuary. A cool, shady place to escape the heat of blazing sun which soaks the gardens, these baths have a double function: somewhere to bathe away the heat of the day and rainwater storage. They are named after the mistress of King Peter the Cruel (doesn't he sound like a joy!). I loved the palace (as you can probably tell I'm a sucker for mudéjar) but I feel it was let down by its overall organisation as a tourist attraction. Short of buying the audio guide (another 5-7€ on top of your already steep ticket price of 9.50€), there is little information available on the best order in which to see things and what you're looking at when you get there! I'd recommend buying the add on if you're a history lover like me because I regret being tight. I was also unaware that you could buy tickets to see the Royal Family's residential apartments on the Upper Floor (Tours leave every hour, only 15 people admitted per tour), which is something I would have been interested in. Shame the ticket people didn't try and up sell that one! Buy the damn audio guide even if you resent it. Don't try and do the Cathedral and the Alcázar in one day - if you go round everything properly, it would be overkill! Follow with a chilled glass of white and some tapas!